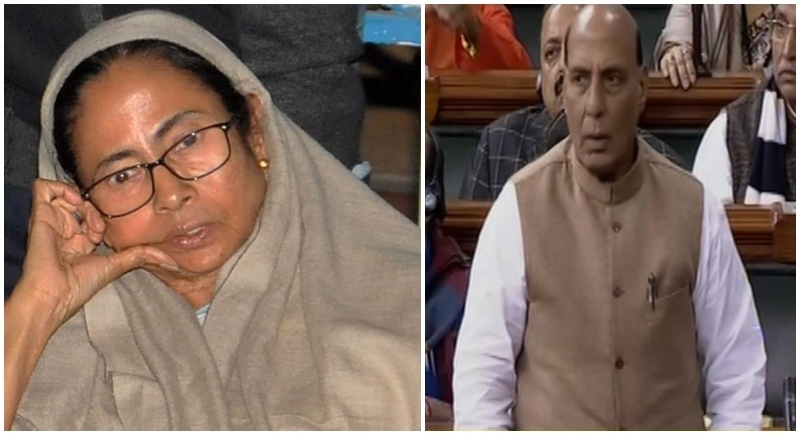 New Delhi, February 4: Amid the ruckus created by TMC officials in Lok Sabha over the CBI probe in Chit fund scam, Home Minister Rajnath Singh on Monday addressed the Lok Sabha saying that the CBI was stopped from doing a lawful act in Kolkata yesterday. This is unprecedented in India's history. Home Minister Rajnath Singh today called up Governor of West Bengal Keshari Nath Tripathi to be apprised of the facts of last night's CBI action over the Kolkata Police commissioner. In an unfortunate and unprecedented situation, officers of CBI were allegedly obstructed by the state police. The Governor apprised Home Minister that he had summoned Chief Secretary and Director General of Police and asked them to take immediate action to resolve the situation. The Ministry of Home Affairs, is closely monitoring the situation. Taking cognizance of the issue, the Central government had deployed CRPF in the central government offices so as to control the unnecessary and uncalled for rant created by Mamata Banerjee. The Ministry had received reports yesterday evening that officers of CBI in Kolkata has experienced intimidation and threat to personal safety in course of investigation into the Saradha scheme being conducted under the directions of Supreme Court. Speaking at the Lok Sabha, Home Minister Rajnath Singh said that CBI had to go to the Police Commissioner’s house as he was not cooperating with them in the investigation. He (Police Commissioner Kumar) was sent summons as well. The Centre respects the state governments. The Supreme Court had told the CBI to investigate chit fund matter fairly so there is nothing unconstitutional in what happened yesterday. Questioning Mamata Banerjee’s action on the drama to sit on dharna, Union Minister Prakash Javadekar said “Why is she sitting on a dharna to save a Police Commissioner? She never staged a dharna when her party leaders were arrested. Is she doing this to save herself?" "This matagathbandhan is divided by vision and united by corruption. This is a mahagathbandhan of corruption," he added. Last night, when the CBI officials headed to Rajeev Kumar’s house to question him, the Kolkata Police detained the officials and the Centre had to deploy CRPF to secure all central govt offices.